Yearning for the complete holiday? Of the beaten-track? Somewhere to slow the pulse or pump up the adrenaline? Cambodia, Vietnam and Laos call. 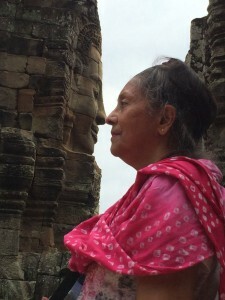 Everyday is a new delight, a new adventure, a new experience to satisfy the thirst of the intrepid traveller, the war veteran, the history buff, the connoisseur of art, culture and beauty, the foodie, the medico-legal eye, the young, the elderly, the housewife. Theravada Buddhism and the patient flow of the mighty Mekong cast their spell – an almost tangible stillness, serenity and silence, ironically producing a mosaic of verdant colour, dance, music, water puppet shows, fruits, flowers, flawless complexions, black twinkling eyes; snakes in jars, fishes on tables; turtles, dragons, phoenix, saffron robes, clean-shaven monks and novices in Wats and Thoms; and pleasing smiling faces everywhere! And the tuk-tuks, egg-coffee, Beerlao, rosella sorbet, sticky black rice with coconut! Yes, the inevitable fresh, green coconut, as large as a large head to slate the thirst. 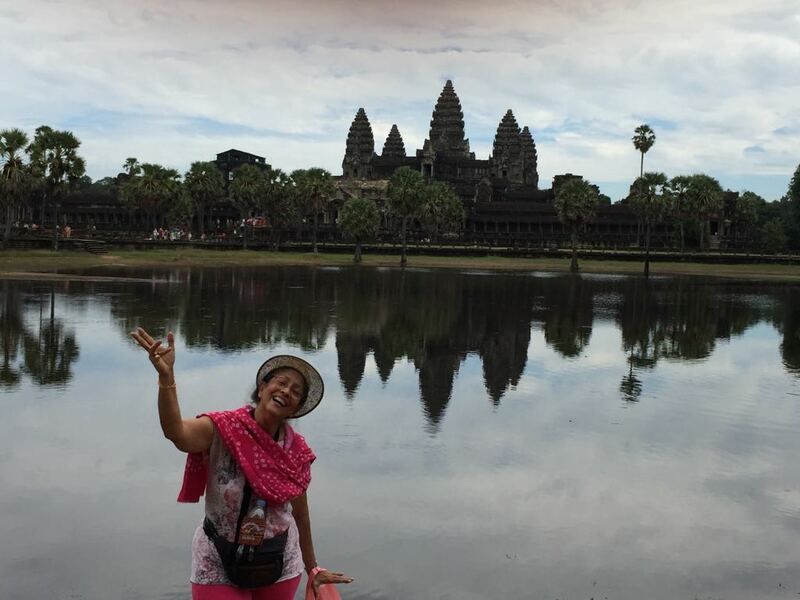 From Siem Reap we visited Angkor Wat. Nothing prepared me for the stunning, awesome silhouette of Angkor Wat rising against the sun, reflected in the water body with its pink and purple lotus. Built by King Suryavarman II in the 12th century, Angkor Wat or the ‘’Palace Monastery’’ was dedicated to Lord Vishnu. The Naga balustrades and intricate and artistic Bas Reliefs record, in detail, episodes from the Ramayana and The Mahabharat. Angkor Thom, built a century later by Jayavarman VII is the “Palace City”, a later replication of the Angkor Wat. The 4 colossal towers with 4 great faces each, of the Avalokitesvara command the 4 cardinal points. We stopped here to make photo illusions, touching our noses to the Lord’s nose. Such close proximity to the Bodhisatva I’d never imagined! We left the lofty Bayon or central tower and headed for Ta Prohm. 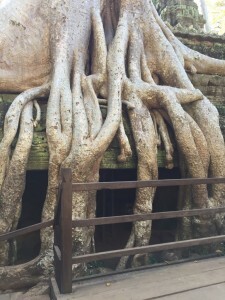 Ta Prohm or ‘Monastery of the King’ is a Buddhist temple dedicated to the mother of Jayavarman VII. Although abandoned, it perhaps makes the deepest impression. Here I was mesmerized by the slow but deadly invasion of the jungle on man’s masterpiece where the roots of giant trees, like enormous pythons or the tentacles of giant octopi slowly and excruciatingly strangle and suffocate the towers, the courtyards, the corridors, the huge blocks of dislodged stones, now fortunately supporting them in their vice like grip while moss, lichen, orchid and trailing tendrils and mammoth lianas are a hypnotizing reminder of the resurgent power of Nature. We arrived by bus to take a boat ride on the Tonle Sap lake. The lake lies in a deep natural basin which fills during the reverse flow of the Tonle Sap river when the Mekong is in flood. We boated Asia’s largest fresh water lake, home to entire floating fishing villages, cooking, eating, sleeping, attending school, church and hospital all on the float. Potted plants and flowers, dogs and cats complemented this lifestyle. Ho Chi Minh city, better remembered as Saigon gave us a chance to shop between visits to the Notre Dame Cathedral, The colonial style Post Office, the Reunification Palace. The War Museum brought alive the horrors of the Vietnam War with its revealing and emotive exhibits. We walked and crawled through the ingenious, intricate maze of the underground Cu Chi Tunnel system and experienced the survival tactics of the Viet Cong escaping discovery by US soldiers. Their struggle, suffering and prolonged ordeal reveal the spirit of a people who sacrificed all to keep their culture alive and flourishing. 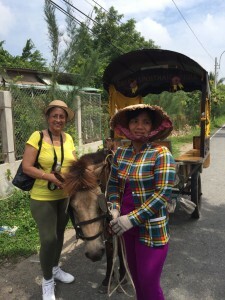 The several little islands at My Tho, in the Mekong Delta had new thrills to offer. 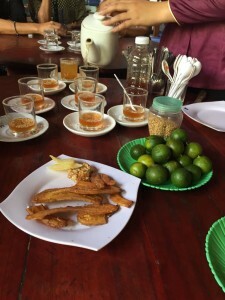 We began with a buggy ride, ate longan, papaya, dragon fruit, pineapple and a new ‘’targola’’ or ice apple like fruit, and drank island honey in tea. Lunch was a learning experience. We were still to adapt to the sparsely set table, with only a saucer or small plate or bowl, to whether the soup began the meal or was enjoyed last. The procedure of serving the fish was a fascinating step by step ritual practised with precision and artistry and attention to fine details. We finally did adjust to their quaint table etiquette. 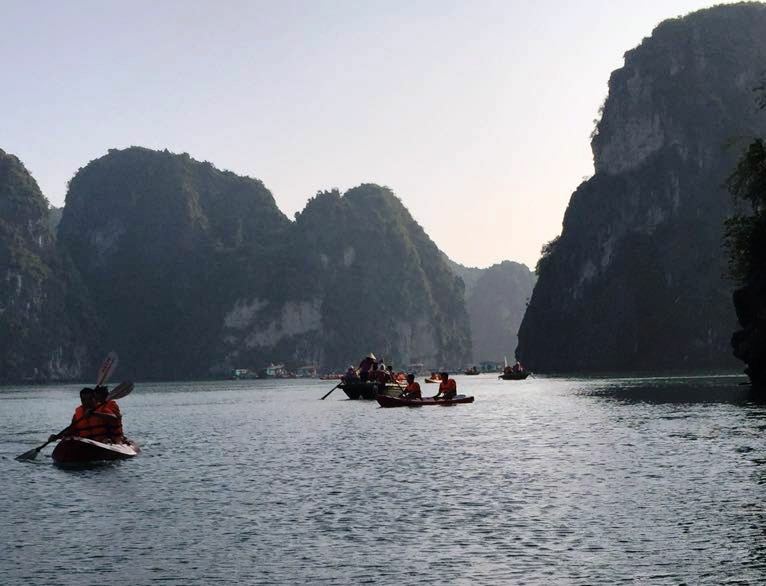 A canoe ride down narrow channels of water through dense mangrove added a new and romantic dimension to the many boating experiences from tiny little canoes, rowed by strong, diminutive women in their trademark sarongs and conical sun hats to large luxury cruisers in the Bay of Tonkin. And then we were in Hanoi, a modern city of skyscrapers, neon lights, dazzling ships and a glitzy harbour line, the capital. As a modern city, Hanoi does not disappoint! In every aspect of life there is evidence of patriotism, spiritual calm and the order and discipline of a benevolent form of Communism. Everywhere I admired lissom women hard at work, in the traditional ao dai, a light flowing silk tunic worn over flared, flowing trousers, different from the equally charming sight of women in finely embroidered sarongs worn with figure hugging waist length blouses in Cambodia and Laos. Shopping, here in Hanoi was on foot. Hidden away in the little bylanes were street foods, local vendors, coffee shops offering brews of aromatic coffee. Interaction with the Vietnamese vendors and tuk tuk drivers around the lake was an amusing challenge as I asked for directions or bargained for good deals. They were always obliging and I come away recalling a simple, warm, clean and hard-working people. 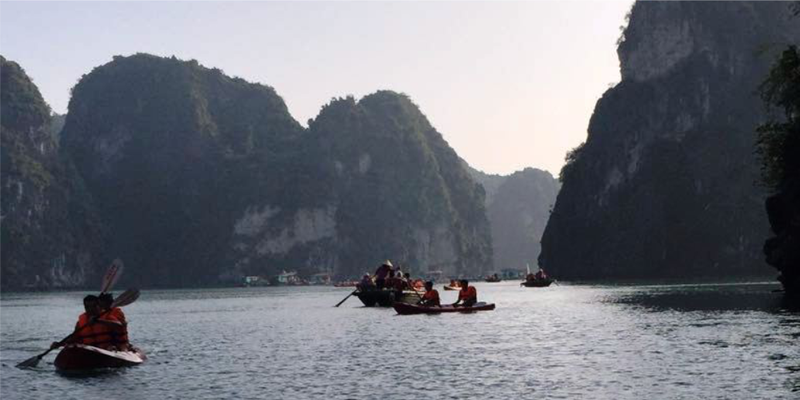 The scenic beauty of the iconic Halong Bay is incredible at sunset, in the misty mystery of dawn. The crystal blue waters dotted with tiny densely vegetated limestone islands, rising sheer out of the sea are, according to legend, protected by a family of dragons, giving it the name ‘’Descending Dragon Bay’’. Here was the chance to lie back, relax, drink and enjoy the sheer luxury of having nothing to do except enjoy the jacuzzi, a Chinese foot massage or the delectable food, especially the sea food straight from the bay and the gentle lapping of water as we cruised or anchored for the night. WOW!! Land-locked Laos with her verdant mountains and the yellow River Mekong, snaking at a leisurely flow through gentle valleys, was the icing on the cake. We entered northern Laos at Luang Prabang. Luang Prabang lies at the confluence of the Rivers Mekong and Nam Khan. It was the royal capital till 1975 and is today a UNESCO World Heritage City. In its pristine simplicity, Luang Prabang is a little bit of heaven in a chaotic world. Our accommodation at Villa Santi Resort was idyllic, royal luxury with old world charm. It was a relief to spend 3 nights here. I unwound, eased my body while my spirits soared. The mountains and the rivers of northern Laos cast a spiritual spell. Their Buddhist temples are a celebration of life and colour. The Theravada school of Buddhism flourishes in the Wats whose pyramidal, ornate and tiered roofs gleam in shades of bright red, green, orange, yellow, white and in glistening sheets of gold. Dragon, naga, tortoise, unicorn and phoenix, like sentinels, protect the wats and the devotees. 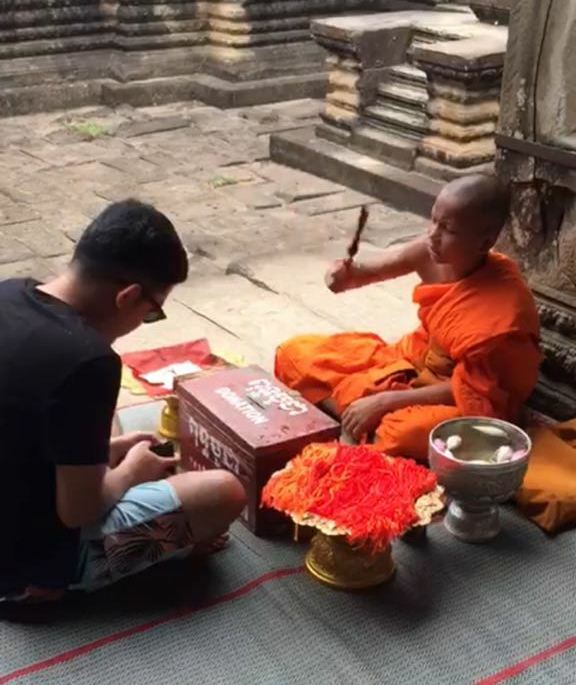 The wats of Laos are living, thriving teaching institutions of spiritual and secular research and study. They function as schools, libraries and venues for ceremonial activities. Novice monks and students lodge here to study and earn degrees. Many reach out to become monks and you see them everywhere as they silently pass in their yellow-saffron robes. Luang Prabang offers other nuances of life, the white-blue Kuang Si waterfalls, the Butterfly Garden, the Rescue Centre for moon bears, the prize catch of poachers who extract their bile, the Pha Tad Ke Botanical Garden, sunset on the Mekong and sunset viewed from Phousi Mountain. A visit to Pak Ou Caves was another enjoyable day. 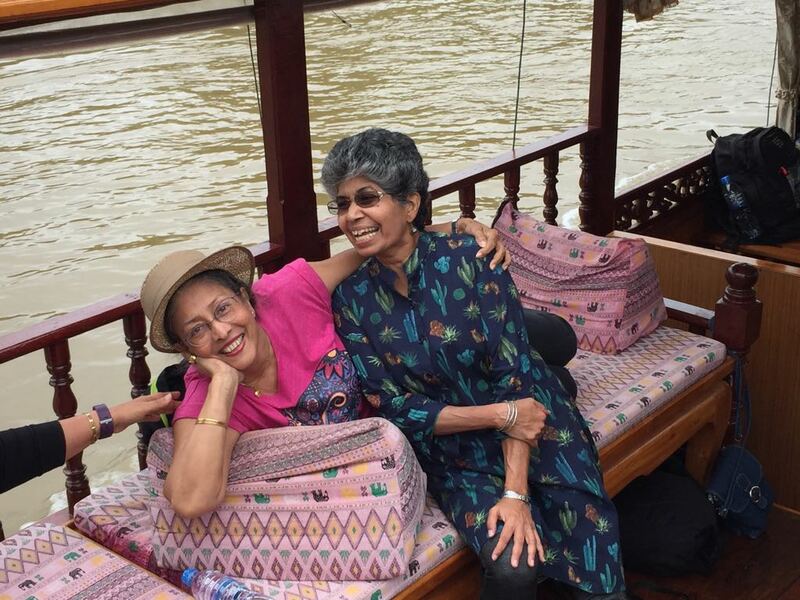 The boat ride on the Mekong was fun, we reclined on padded seating, enjoying the chill breezes, first shivering then basking in the warmth of a wintery sun or we danced with abandon to Bollywood beats to the delight of our ever- affable guide, or enjoyed Beerlao. We were now ready to make the ascent to the Pak Ou Caves. Some preferred to relax in the boat, some made it half way to see the 1000 Gold Buddhas and some stalwarts made it to the top and the Buddhas. At night, we strolled through remarkably clean and orderly lines of local stalls selling street food, local curios and crafts, trinkets, souvenirs, clothing, sarongs in local prints and bags in Laotian weaves, mats, pants, spices, local knick- knacks, magnets, bamboo crafts, bells, umbrellas; snakes, spiders, scorpions in whisky; and exotic fruit shakes. The cornucopia of sights, tastes, smells, sounds, hues all presented by an easy, pleasing people, willing to cut prices, made night shopping a relaxing and enjoyable exercise. The early morning market is worth a visit to pick up Jasmine rice, black sticky rice, Mekong river weed and spices. But move on. 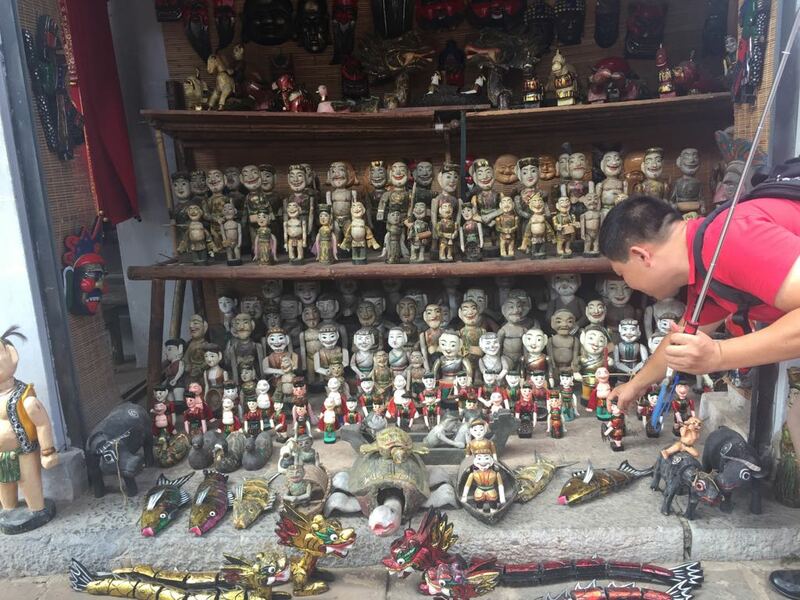 Here they sell everything that walks or crawls, dead or alive. No place for the faint-hearted! Live frogs, crabs, shrimps, grubs, maggots, cicadas, every creepy crawly, and the unimaginable and unidentifiable! This market is a must visit to give you the true flavour of the land. 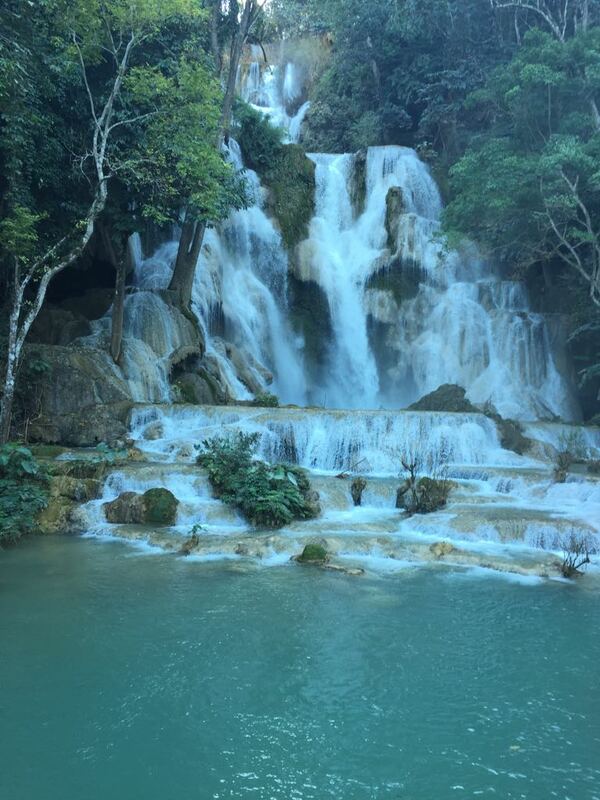 Laos – a salving balm – deserves a longer stay to seep in its magic! Gentle, serene Luang Prabang so refreshingly different! It liberated my body, mind and soul, and l returned home thirsting for more.